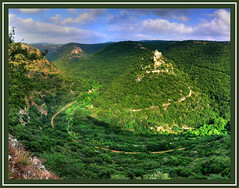 The Yam lYam Hike (Sea to Sea) is one of the most popular hiking trails in Israel literally crossing the country from west to east, from the Mediterranean Sea to the Sea of Galilee, crossing some of Israel’s most beautiful scenery in the Western Galilee and Upper Galilee regions. The Sea to Sea hike is walked by thousands of Israelis and tourists every year, and takes between three to five days depending on how fast you walk, along marked scenic trails. The Yam lYam trail starts in the city of Nahariya on Israel’s Mediterranean Coast, in the Western Galilee region of the country. Most people travel here by train or bus with all the gear they will require for the hike. People opt to complete the hike in between three to five days. Which one you do is determined by how experienced you are at hiking and how leisurely you would like the hike to be. The Yam lYam trail is fully marked, and starting from Nahariya, heads directly inland through the flat Coastal Plain, and the fields belonging to kibbutzim and moshavim who grow a huge variety of crops. As the Coastal Plain is left behind, the terrain begins to pick up and the final glimpse of the first sea (the Mediterranean) is left behind. You will pass the Montfort Fortress. Heading from Abirim, the trail continues east until the village of Fassuta, when it turns south winding its way past the villages of Elkosh and Hurfesh and towards Mount Meron. Following this is largely the descent down to the Sea of Galilee (the lowest freshwater lake on earth!) passing the famous city of Safed and ending on the shores of the Sea of Galilee just north of Kibbutz Ginosar. The Yam lYam Sea to Sea hike is a total of 89km starting at sea level, climbing to 1,200 meters, and then descending to -400 meters. Splitting the trail into three, four, or five sections is a personal choice, some people base it on the location of overnight campgrounds, whilst others prefer to find zimmers or other rural accommodations to stay in overnight, and plan the trek around that. Whilst you can do the Yam lYam hike all-year-round, the nicest times are spring and fall – temperatures in the summer can be incredibly high. The route passes a natural spring every day, and water is a big issue of course when hiking in a climate as hot as Israel. There are villages you will pass along the way where you can detour to collect supplies, however, it is best to come prepared! Many people are comfortable hiking the trail alone, but if you want, you can be accompanied by a guide who can guide the trail, explaining the history and geography of the region and/or arrange the logistics so you don’t have to carry your supplies all day long. For more information, check our article about Yam lYam Sea to Sea Tours.